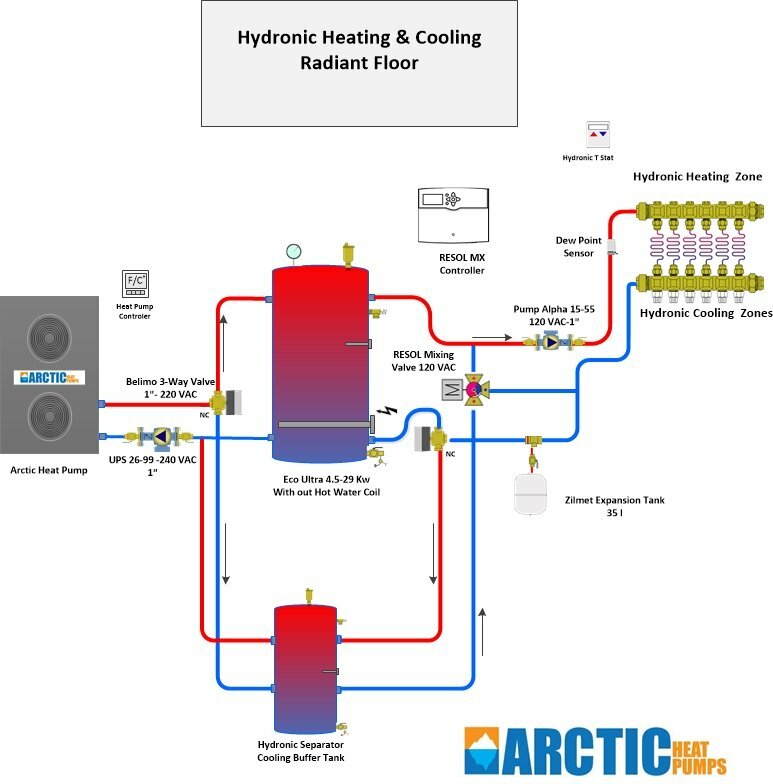 One of the most often overlooked areas of a Hydronic Air to Water Heat Pump is the ability to cool as well as heat. 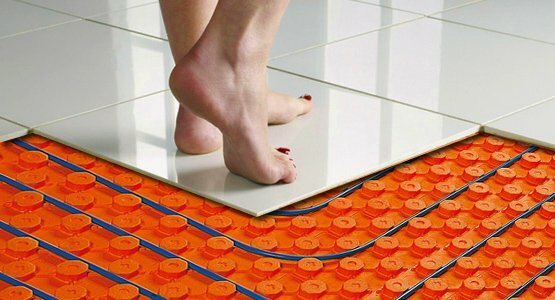 Most home owners are familiar with the advantage of radiant floor heating versus centralized forced air heat, but most home owners including builders have no idea that radiant floor cooling is possible and can be very cost effective for those building a home with hydronic heat. Radiant cooling is quiet, dust free, efficient and has been used in Europe for decades. Most important, studies in USA by Lawrence Berkley National Laboratory in California estimate the energy saving of radiant floor cooling to be over 30% of traditional forced air cooling! The number one myth is that you can’t cool a slab because it will condensate and result in a wet floor. This is true if you don’t have the proper controller in place. 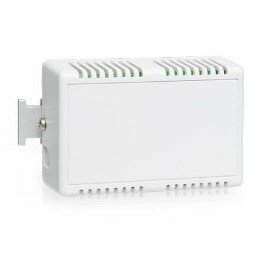 However, if you incorporate a dew point switch in your design such as the REESOL TS510 which integrates with our MX controller you can completely eliminate the chance of any moisture on the floors as a result of cooling. In fact cooling only requires floor temperatures of 10 degree difference to make a big impact on the cooling temperature indoors. An average building running 66 -68 F chilled water can easily keep temperature to 68-76F. A dew point sensor is used to monitor the condensation on the lines going into the slab, if these lines start to condensate then the sensor will tell the controller and the controller will adjust the input temperature going into the slab to ensure there is never a chance of floor condensation. One of the biggest savings of radiant cooling comes from the pump cost versus the fan cost. A typical circulation pump consumes only .5 Amps when cooling or heating a house. A typical fan coil AC unit can run as high 8-10 amps just to run the fan motor. Another advantage is the even distribution of cooling/heating in the home. No hot or cold spot and no wind noise or draft occurs when cooling with radiant floor heating. In the summer months we also need to run our AC to remove the humidity in the air. The problem with an AC to dehumidify is it only works when the AC is working! This means that in humid climates the AC is running constantly to remove moisture but the result is the inside temperature cools to below the AHRI standard for healthy living. This can result in “summer cold symptoms” and other health issues. A radiant floor cooling system will not solve humidity issues but installing a large or whole house dehumidifier can do this job very easily at about ¼ the cost of an AC. Aprilaire makes a complete line of whole home dehumidifiers for under $1000 USD. A hydronic air to water heat pump is the easiest way to maximize your home comfort. With the ability to provide both heating and cooling you can leverage your investment across all months of the year. Let’s not forget the advantage and cost savings that an Arctic Heat Pump can have on domestic hot water savings! If you are looking for radiant floor cooling and would like us to assist you with your design at no cost, please give us a call or contact us.